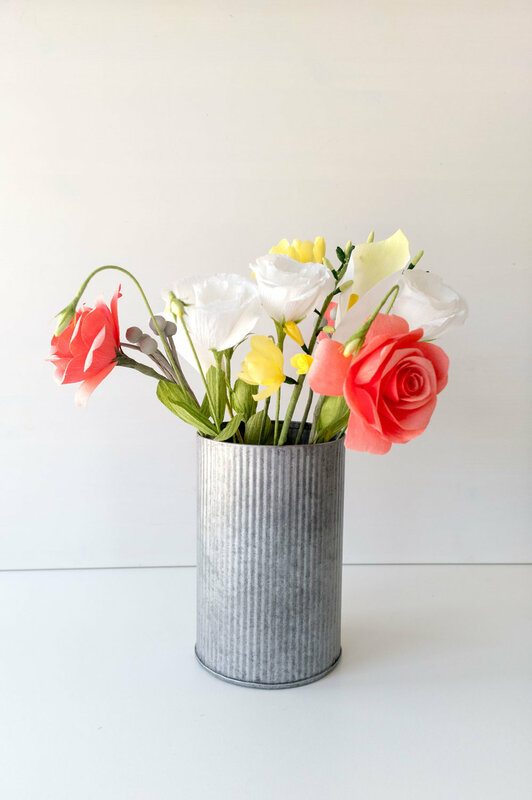 Sisterly Love: A Paperversary-Inspired Surprise Gift — Paper Rose Co.
With March right around the corner, I've been steadily working my way through a whole slew of new flower designs and mixes for Spring and Mother's Day (yes, already!). In the meantime, I wanted to share another one of my favorite recent projects. This piece, while technically a Paperversary bouquet, was cleverly gifted for Christmas. One of my customers caught wind of these projects and knew her sister-in-law needed one of her own. Stacy told me that Katie was particularly attached to her wedding bouquet and that she has even been using a photo of it as the background on her phone—since 2014! And for a good reason—her bouquet was beautiful! This arrangement was another one of those cases where until I saw the photos I probably would never have thought to combine these colors or elements, but I sure am glad her original floral designer did! The white lisianthus (quickly becoming one of my favorites to make) and calla lilies created a nice crisp canvas for the pops of yellow freesia, red roses, and slate gray brunia berries. As I started to finish the last pieces, I mentioned to Stacy that I enjoyed how playful and fresh these blooms looked when kept loose in a vase. She agreed, and we opted to keep them that way instead of wrapping them like her original bouquet. This way Stacy can enjoy her flowers in different combinations or styles over the years too! I love helping people create meaningful gifts like this one. Until Stacy emailed me, I hadn't thought of how lovely a Paperversary bouquet could be as a gift between sisters or friends—or for a Mom? With Mother's Day coming up, this might be a real winner! If you have an idea for Custom Designs or a Paperversary bouquet for a friend or family member, send me a note. I can't wait to see what we can come up with together!